Looking for a cheap alternative for the iPad 2 ? Look no further than Amazon Kindle Fire. In the fourth quarter of 2011, 3.8 million units Amazon Kindle Fire has been sold. Still far from iPad 2, 15,4 million iPads sold. However, the price gap is huge. The cheapest iPad 2 is priced at $499, while the Kindle Fire is only $199. The popularity of the Kindle Fire shows that price is a big advantage. You must not underestimate the Amazon tablet. It is a very good device, unlike other Chinese Android Tablet, the Kindle Fire is a great tablet PC. It can handle movies and musics. The screen is also great for reading ebooks and browsing the internet. While the 7-inch screen is very small, compared to iPad 2 9.7-inch screen, the Kindle Fire is small enough to carry around. 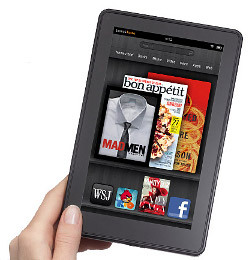 If you are considering buying a cheap and good tablet PC, you will want to put Amazon Kindle Fire on your shortlist. Check out the Kindle Fire on Amazon website.